At one time or another, everyone’s spent far too much time rooting around in their couch for a lost remote control. You end up looking under furniture, in the cushions, wondering if you carried it to another room, and by the time you find it you’re too frustrated to care about what you were going to watch. There is one item that never seems to leave your side, however, and that is your smartphone. Thanks to modern technology, now your phone can replace your clunky old remote, making it that much easier to keep track of the essential technology you need. It doesn’t matter what operating system your smartphone runs on, there are numerous choices out there for turning your phone into the universal remote of your dreams. For $100, Peel sells an infrared blaster that looks quite a bit like a pear. Once you’ve purchased that, you can download an app from either the iOS App Store or the Android Market that will help you find programming relevant to your tastes. The software will allow you to control the volume, your DVR and even let you socially share what you’re currently watching. The Re is a device buy for your iPhone, iPad or iPod Touch that plugs into the 30-pin charging port and then works in conjunction with a free app from the App Store. 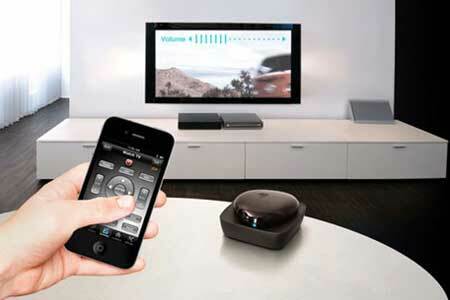 The actual device will cost you $60 online, but as it works off of traditional infrared, and has the ability to learn codes beyond what is in its built-in database, it should work with nearly any home entertainment device on the market today. While its $200 price tag makes it one of the more expensive options, RedEye is a dock that will emit an infrared beam to pretty much any device you have, allowing you to take your phone just about anywhere and not worry about line-of-sight. The dock will sync the appropriate controls to your phone, Kindle Fire or other device. The company does offer a second option called RedEye Mini for iOS devices, an infrared transmitter that plugs into the headphone jack. With its built-in codes, you can take it on the road to use in hotels as well. It sells for a more economical $50. While company specific, the Samsung Remote app for Android will allow you to control any television or Blu-ray player connected to the same router as your phone. Extremely handy if you have devices from the largest home entertainment manufacturer in the world, and best of all, the app is free. There are a lot of options out there these days, and it really boils down to personal preference. If you want to connect your device with just an app, both the iOS App Store and Android Marketplace are filled with programs will do that for you. If you want to move away from the traditional remote and make your smartphone even more the center of your life, there is definitely no shortage of options out there these days.